A friend in Delhi told me that I simply had to get this book which, he said, contained a wealth of information and is one of his favourite books. I could easily see why as Marc Dawson's latest publication comes packed with loads of facts and figures, a lot of it bizzare but always tremendously interesting and enjoyable. 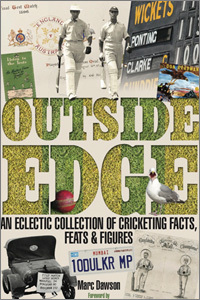 There are twenty chapters ranging from genuine cricket statistics to oddities involving food and drink. There is a wealth of genuine playing material but, if you are more interested in learning how a Matt Prior six plopped into a spectator's ice cream splattering his face, Outside Edge is very much a book for anyone interested in the statistical as well as light-hearted events on and off the field. The depth of Marc's research into finding all these quirky facts and figures includes Royalty, MPs, transportation and medical matters. Having assimilated facts and figures for The Lord's Taverners, I was naturally aware of the Duke of Edinburgh's vast input to the charity but nonetheless found out even more through Outside Edge. Who knew that Kevin Pietersen's brother became the new vicar in Workington? If you want to know which Prime Ministers played First-Class cricket, page 171 will provide the answers. Almost a full page is devoted to high-brow conversations between President Obama and Prime Minister Cameron about cricket and, on a less savoury note, a list of cricket's jailbirds is mentioned along with their injudicious acts. If gory aspects like murdered cricketers - though not through acts of terrorism - interests you, page 234 has a fairly alarmingly long list in the Crime and Punishment chapter. On a happier note, First-Class cricketers who appeared in the Olympics are given a mention as are instances of cricket appearing on the silver screen. Adorned with many photographs, the book is also embellished with many quotes which adds to the enjoyment. One wonders where on earth and how much research must have gone into a book of this nature but I am sure that anyone who reads it will be immensely indebted to Marc Dawson. In his, as usual, excellent foreword, Geoff Lawson opines that " clearly Marc needs to get out of the house a bit more." Maybe he does, maybe we could all be spellbound in our houses reading this mesmeric book but, sorry, Geoff, I'm not moving for the time being and will be looking for copies of Marc's other publications.